aerolatte French Press 3 cup. French Presses give any earthy, fuller flavor for natural taste. French Press incorporates an easy to remove, dishwasher-safe, borosilucate glass carafe with a built in measuring guide. 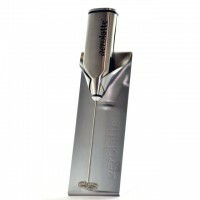 A secondary microfilter in the pour and special mechanics for a smoother and easier plunge. We even give you a measuring spoon. Spare carafes and filters are available. Aerolatte’s French Press Coffee Maker allows precise control for making a better brew at home. 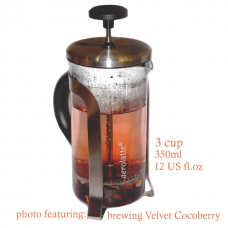 It’s elegant design with 3-cup (12 ounce) capacity is designed to extract the most flavor from ground coffee. Perfect for the coffee enthusiast or at-home baristas. Achieve a more flavorful brew without buying expensive machines that hog precious counter space. Unique measuring gauge for water levels printed right on the glass and coffee measuring scoop makes perfect coffee. The lid, with built-in mesh plunger and microfilter in the spout, pushes grounds to the bottom of the pot and captures unwanted grounds as you pour. Simply measure medium-ground coffee directly into the glass beaker, or grind your own whole beans (approximately 2 rounded tablespoons of ground coffee per 8-ounces of water, or to your desired taste). Add a small amount of just-boiled water. Stir the grounds gently so they sink and wait 30 seconds. The coffee ‘blooms’ as it mixes with the water, opening up to release more flavor. Fill the pot to the desired level with boiled water. Place the plunger lid inside the pot so the screen is level and sits just above the water line. Let the coffee brew for a total of 3 to 5 minutes, from the time you added the water. Brewing time is determined by your coffee’s grind size (the smaller the grind, the stronger the brew), depth of roast, and desired coffee strength. Practice to discover which brewing time is best for your tastes. When coffee has brewed, begin plunging. Hold the pot by the handle with one hand and slowly plunge with the other, for about 20 seconds. The plunger pushes grounds to the bottom of the pot and filters them from the fresh-brewed coffee. Don’t allow the coffee to sit in the pot with the grounds, or it will continue to brew. Pour your coffee immediately and enjoy. Aerolatte’s French Press Coffee Maker is easy to use and clean. The high-heat borosilicate glass beaker is dishwasher safe -easily lifts out of the stainless steel frame for quick cleanup. Hand wash all other parts in warm, soapy water. Replacement glass beaker and filter is available. 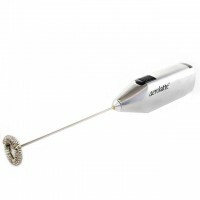 Aerolatte Milk Frother, Satin for Matcha Latte Matcha Latte Matcha Latte Aerolatte Milk Frother..
aerolatte Deluxe Edition Milk Frother with Stand, Stainless Steel aerolatte Milk Frothers - the Ori..